The border-jumping Ebola outbreak and development of the Square Kilometre Array radio telescope prove science diplomacy is essential for Africa. A workshop in Namibia, co-organised by AAAS and TWAS, explored the challenges – and the rich potential. For Bernie Fanaroff, a distinguished radio astronomer who until 2015 led South Africa’s Square Kilometre Array (SKA) radio telescope project and currently acts at the project’s strategic adviser, science diplomacy is paramount. 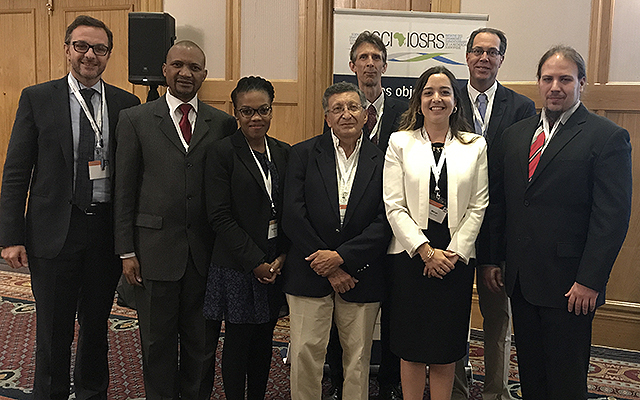 Fanaroff spoke at a science diplomacy workshop led by TWAS and the American Association of the Advancement of Science (AAAS) in Windhoek, Namibia on May 22. The workshop included the Academy of Science of South Africa (ASSAf) and the TWAS Regional Office for Sub-Saharan Africa (TWAS-ROSSA) as partners. More than 70 participants from 17 African countries, as well as a delegation from the New Partnership for Africa’s Development (NEPAD), attended the one-day workshop, which also coincided with the annual conference of the Southern African Research and Innovation Managers Association (SARIMA). For Fanaroff as well as other workshop speakers, science diplomacy  – or the use of scientific collaboration among nations to build international partnerships – has been integral to their work, even if they did not realize it at the outset. Fanaroff explained that although he expected the scientific and engineering aspects of the SKA project to dominate his work, he found that the project’s international governance structure meant he was often working in the world of diplomacy just as much as in the world of science. He also emphasized the importance of SKA to develop human capital, bring about local and regional innovation, and expand capacity for data science in Africa. “[These telescope projects] need great coordination and intergovernmental agreements on the specifications of the equipment, software, human resources and leadership – among many other issues,” Fanaroff said. When SKA is completed in the late 2020s, it will be the world’s largest radio telescope and science infrastructure, with the total area of the dishes measuring one square kilometer. The project is being led by South Africa and Australia, in partnership with eight other countries. Additional dishes will also be built across southern Africa as well as Ethiopia and Ghana. Thomas Daughton, U.S. Ambassador to Namibia, also emphasized the importance of science over his 30-year diplomatic career. He opened the workshop by outlining a number of diplomatic hurdles encountered, for example, when trying to arrange a multi-partner climate research project between the National Aeronautics and Space Administration (NASA) and universities in the U.S., South Africa, and Namibia. Marga Gual Soler, project director in the Center for Science Diplomacy at the AAAS, and Peter McGrath, TWAS’s science policy/science diplomacy programme coordinator, then gave introductory presentations on the history of science diplomacy, its various definitions, and examples of how it works in practice. The SKA, for example, is a textbook example of diplomacy for science – or how countries come together to create major scientific infrastructures that would be too complex and too expensive for any single country to build and maintain on its own. Joining Fanaroff on a panel presenting case studies from the region were Dimitri Prybylski of the U.S. Centres of Disease Control (CDC), Namibia office, who was involved in coordinating the international response to the Ebola virus outbreak in West Africa; Markus Theobold of the EU Delegation to Namibia in Windhoek; and Pierguido Sarti, Italian science attaché to South Africa, Namibia and other countries in southern Africa. Prybylski outlined some of the factors that permitted the rapid spread of the Ebola virus to illustrate how science, public health, cultural practices and diplomacy are all intertwined. The affected nations were largely poor and had no prior experience with Ebola. Their populations traveled frequently across the porous borders; burial practices were unsafe. Health infrastructure was limited, and the few health professionals were spread thin across multiple health threats. And given a history of regional conflict, many in the public distrust governments and health workers. The biggest lesson learned from the epidemic is the need for strengthened international frameworks for response in an increasingly mobile, interconnected world. During the discussions that followed, Fanaroff admitted his ignorance of how “science diplomacy worked” – even though it was crucial for the successful development of the SKA – because of the unusually smooth process for getting this massive international project off the ground. He stressed, however, that even if the scientific and engineering processes dominate, it is never absolutely clear-cut, and the national interests of the partner countries always seemed to intrude. Presenting Namibian case studies were Gillian Maggs-Kölling, director of the Gobabeb Desert Research Centre , which carries out research, training and development activities with a host of national and international partners; and Michael Backes of the Namibia Scientific Society , an 800-strong membership association that promotes scientific outreach and environmental awareness to the public and policymakers. For the final session of the workshop, participants were divided into three groups (East, Southern, and West & Central Africa) to discuss reactions to the presentations, and to identify challenges and opportunities in science diplomacy for their region, bringing forward specific examples. Among the common challenges cited were issues such as the disconnect between ministries of science and ministries of foreign affairs in many African countries, as well as the absence of science advisers to government officials and the lack of science attaches at embassies. The issue of ‘de-colonisation’ was also raised. African institutions must do a better job of decoupling their thoughts and actions from colonial constraints and borders, agreed the participants. Such colonial pasts still heavily influence many countries and regions so that they tend to work in silos. African countries must get better at adopting regional approaches rather than the current common but insular practices of one-country approaches. One success story in this regard is the development of peace parks  – cross-border wildlife reserves that allow for shared expertise in biodiversity, monitoring of wildlife trade, and training staff, among other joint activities. Among the other scientific issues raised were sustainable fishing practices, for example among countries of the Atlantic coast or the Indian Ocean coast of the continent. Since 2013, TWAS and the AAAS Center for Science Diplomacy  have organized a joint annual summer course  on science diplomacy at TWAS headquarters in Trieste, Italy, which now has over 200 alumni from around the world. The aim of TWAS and AAAS is to use the feedback from organizers and participants to develop a weeklong course tailored for Africa.